Green Glue is a visco-elastic damping compound designed to use between 2 sheets of drywall to substantially increase the performance of a standard stud wall, or to retrofit to existing walls to help reduce noise levels coming in and going out of room it is installed in. 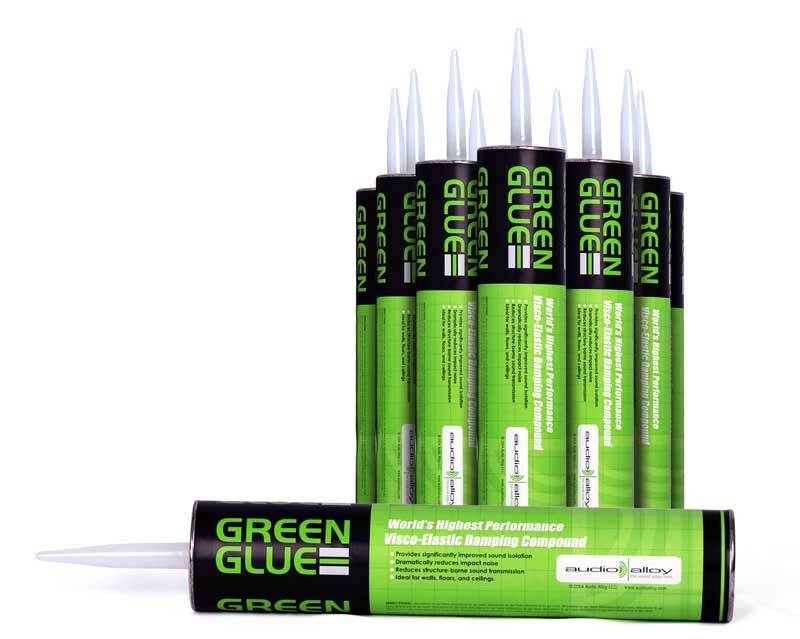 Green Glue works by raising the mass of a structure, which in turn lowers the resonance point, these combined help to reduce the levels of vibration that are transmitted into the wall or ceiling. Typical values for a steel stud partition show that a Green Glue installation will give 8dB increase in Rw and an Rw+Ctr increase of 9dB over a standard steel stud install. Using Green Glue in combination with Resilient Channel increases the performance of the assembly while limiting the damage down by short-circuiting the RC, used on block walls this system can give a reduction of 8dB. Green Glue is available in tubes, cases and pails.